A raised garden bed is a popular way to grow vegetables. Raised beds elevate the root zone of plants above the surrounding soil, allowing a plant's roots to warm up quicker and the soil in a raised bed to drain easier. 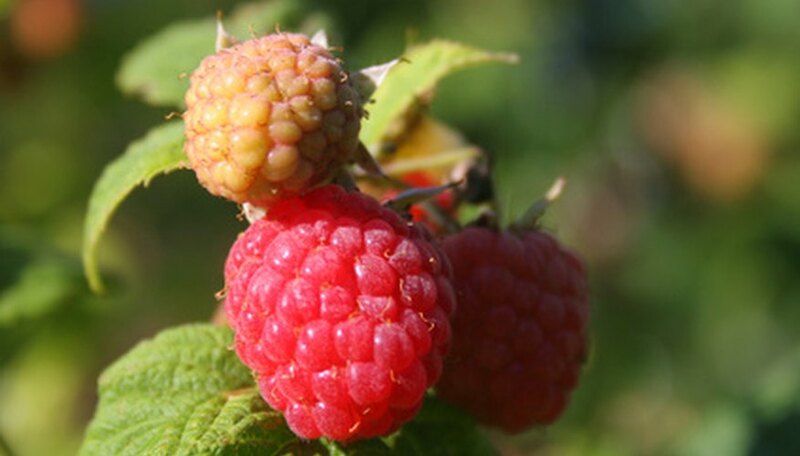 Warmer soil conditions combined with faster draining soil will ward off root rot and soggy soil problems, which makes raised beds a good idea for raising raspberries. Raspberry plants hate "wet feet," which make them hard to grow in areas with high-clay-content soil. Choose a sunny location for your bed and decide on the size and shape of the bed. Add a rich, loamy soil mixture into the to the area where you will be constructing your bed. Move the soil around with a shovel so that the average height above ground level in the entire bed is between 1 1/2 and 2 feet, with the minimum width being 2 feet. Work the soil with a garden rake so that it slopes gently down to the existing ground level around the edges. Add organic matter to your bed, such as compost, peat moss or manure, at a rate of 2 to 3 bushels per 100 square feet. Mix into the soil with a rototiller. Add ammonium nitrate to the soil at a rate of 1 lb. per 100 square feet and till in to aid in decomposition of your organic matter. Dig a hole 1 foot wide by 1 foot deep per plant. Position each plant in the center of the hole and spread the roots out. The location where the roots attach to the cane should be 1 to 2 inches below soil level. Fill the hole with soil and press firmly to remove any air pockets. Repeat for all other plants, with spacing of 3 feet. Rows should be 6 to 8 feet apart. Water thoroughly to settle the soil and prune the cane height to 6 inches if not already done by the nursery. Build a trellis system for each row. At the end of each row, bury a 6-foot-tall 4-by-4 post 1 foot into the ground. Screw one 18-inch-long length of 2-by-4 board horizontally at the top of each post and ensure it is centered on the post. Pound a nail into each end of the 18-inch-long boards, leaving 1/2 inch of the end of the nail exposed. Stretch 12-gauge wires between the posts and tie them to the nails. Pound a nail into each side of the posts 30 inches from the ground, leaving 1/2 inch of the end of the nail exposed. Stretch 12-gauge wires between the posts and tie them to these nails. Fertilize your raspberry plants 4 to 6 weeks after planting them. Apply 1 tbsp. of 12-12-12 fertilizer per plant. Water throughout the summer to provide 1 inch of water per week when rainfall lacks. The rainfall and irrigation combined should equal this figure. Cut the 1-year-old canes level with the top wire in the spring, using pruning shears. Cut 2-year-old canes back to soil level at the same time. Apply a 2- to 3-inch layer of mulch around your raspberry plants to help retain moisture. Mulch also prevents weed growth around your plants. Refrain from applying supplemental water in the winter months. The raspberry plants can easily rot if kept excessively moist in the cooler winter months.